Fast Food Incidents That May Have You Eating At Home. Some of us often wonder what really goes on in the kitchen of fast food restaurants. And many of us continue to eat there despite the hundreds of stories we see of employees doing “not so nice things” to the products they sell. 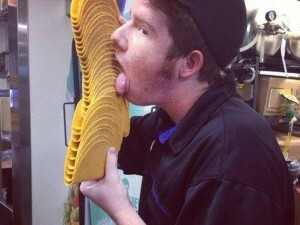 Last year a Taco Bell employee posted this photo to his Facebook page doing the unimaginable to a stack of tacos. I’m pretty sure those tacos were not thrown away, I wonder who got that lucky combo meal. Then there was the mashed potato taster at KFC. There were several photos posted of her licking a pan of mashed potatoes. She then served those potatoes to customers throughout the evening. 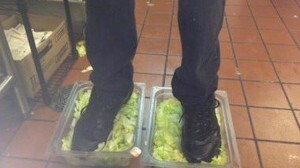 This photo shows a Burger King employee standing on two bowls of lettuce. These photos were taken, then posted to Facebook. They bragged that they served this tainted lettuce to customers all day. I guess this guy had a long day at work. This Burger King employee decided to suds up the dish sink and take a nice hot bath, then post these images on his social media site. He commented that he used the same soap water to wash that evenings dishes. Here goes some extra toppings for you, no charge. The Domino digger. I guess this employee was not so proud, and decided to blur out his face. But he bragged that he added some extra toppings to someone’s pizza that night. I’m sure after being in the oven for 20 minutes, it crusted up and lost its gooey texture. It probably blended in just fine with the sausage. I don’t know about you, but it makes me think twice about ever eating out at a fast food restaurant again. This is just disgusting!